Amazon is a great platform to start your selling business. But not all Sellers make great profits. Picking the right product is the most important stage in Amazon Selling. Product research helps you understand what the customers really want. Products that have a market demand obviously sell better. Finding Amazon products with good selling potential increases your sales and therefore your profits. Product research can be done in all stages of your business. In the initial stages, product research helps you clarify and refine your Product Ideas. In the later stages, product research helps you find new products that can be added to your Amazon business to widen your market and increase your profits. Amazon product research is made very simple with SellerApp. Find products with minimal failure risk and maximum profits. With SellerApp take informed decisions by shortlisting only the best selling products on Amazon. 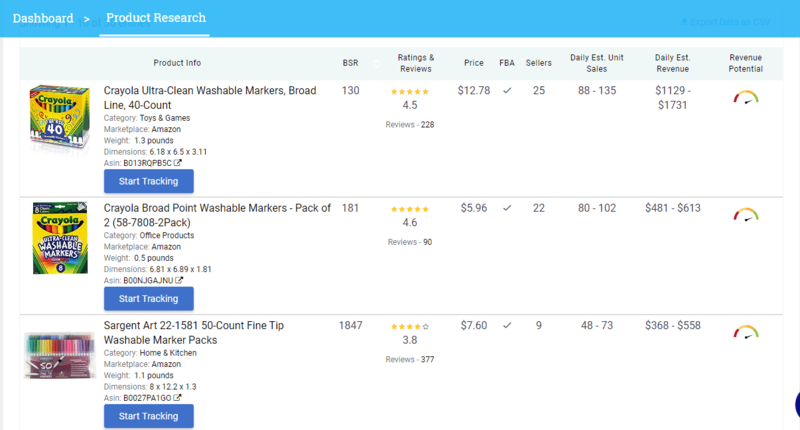 Simplified data backed Amazon Product Research Tools from SellerApp. Helps you quickly analyse products on the go. The Chrome Extension helps you analyse products with a single click as you browse on Amazon without shifting tabs. The Amazon BSR of a product can be found in the product description section. Products that have seen a great spike in their sales rank and have an increasing sales rate. Products that are new to the Amazon market but are already smashing the sales bars! Products that are experiencing a huge demand and are in the trend. The best selling products on Amazon now. The most gifted and the wish listed products! These products can be a good bet for bundling or can also be sold as a standalone product. SellerApp’s Amazon Product Research helps you shortlist the best products for your Amazon niche based on different filters majorly Amazon keywords. You can even find the top products that rank for a particular keyword on Amazon. Shortlist products from the categories you are interested in, with the best CPC rate, maximum revenue rates. Even shortlist products with the best ratings and reviews! Track keywords to understand which keywords are being are the most searched and are bringing the most sales. SellerApp Chrome Extension helps you research and analyse Amazon products on the go. Get a 360-degree view of the product with a single click. SellerApp Chrome extension is developed to make product research a piece of cake. If you are looking to scale your profits fast, SellerApp Chrome Extension can make all the difference. SellerApp Chrome extension provides accurate critical data required to quickly understand the profitability of a product and examine the product strategies. analyse the sales potential of the product with the estimate revenue potential, and per day sales. Choose optimal pricing points and fulfillment modes with Profit calculator. Track interesting products as you browse through Amazon. Understand keyword strategies of competitor products to get a hold of their most profitable keywords with Product Keywords. Keep track of the trends and examine the repricing strategies with Pricing Trends. analyse the review strategies with Review Trends. The Chrome extension data is synced with the SellerApp web app which digs into the nitty-gritty details of the product to provide a detailed data analysis required for a thorough analysis of the product.